Okay, no stalling or beating around the bush. We are all busy packing, traveling, cooking, decorating and preparing for tomorrow's festivities. 1. I am really digging this scarf. It's my new favorite, for the time being. I just got it last week for and have already worn it three times. Instagram pictures don't lie. It's a pattern mixer's dream. Polka dots, stripes and florals equal a win-win-win. 2. I always send out Christmas cards. I have never missed a year since Ross and I got married 12 years ago, but this year I am thinking of skipping the whole process entirely. Don't get me wrong, I love how our family pictures turned out and would love to share them. But let's be real, I could design a card, slapped it up on Facebook, Instagram and Twitter and be done. It would reach more people than I have on my card list and save a mucho amount of moolah. I just can't find a card design that I like that doesn't end up costing $150.00, not including the postage. Anyone know about some smokin' deals out there on cards? I am just torn on what to do. 3. I am THAT girl who already has the tree up, the stockings hung and the burlap draped. Yes, I like to take one holiday at a time and plan on thoroughly stuffing my face and giving thanks tomorrow. I just like to have everything up and ready once we get back from the Thanksgiving holiday. It's a tradition. Don't judge or roll your eyes. Give a girl a break, I mean, we don't have the lights strung outside yet. And, in case you are looking for some SUPER DUPER cheap ornaments, hit up The Dollar Tree. You know, the place where EVERYTHING is a $1? Some of my favorites have come from there. 4. Completely unrelated to the holidays, I want new bedroom furniture!!! Yes, that was THREE exclamation points. This was the first big purchase we made as married couple....ELEVEN YEARS AGO! I am not sentimental about it at all. I want it gone. Ross says no. He doesn't put his foot down very often, but he is not budging with this one. He says it's solid wood, durable and that nobody really goes into our bedroom besides us, so who cares! Who cares? I care. So, my thinking cap has been placed upon my head to figure out what I can do to give this outdated furniture a fresh new look. I thought about making my own headboard with some Pinterest help or restaining. Any suggestions? I am desperate. It looks like I will continue to dream about this bed from Pottery Barn. So, there you go, another Wednesday full of random. I hope everyone has a blessed and happy Thanksgiving. Be safe if you are traveling. Forget about the diets and calories. Put the stresses of life aside for the day. Enjoy your time with family and friends. And write down ten things that you are thankful for. Writing them down on paper helps remind us all how lucky we are, no matter what life has thrown our way. God bless! **If you are linking up today, please use good manners. I kindly ask that you follow my blog and link back to it in your post. It's really kind of rude if you don't. Oh, and go meet some new friends! Thank ya! One last thing and it's pretty dang important! 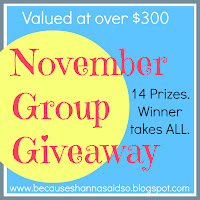 A GINORMOUS group giveaway is going on right now. Click here to enter. It's over a $300 value!! I know I have been desiring some new bedroom furniture too! Loving the Palace Bed, it's oak with leather ! So pretty, but expensive! I can't help it, I want it! Love the scarf! Try OvernightPrints.com you have to do a lot of the customization yourself but they are usually pretty cheap and the quality is great for christmas cards! Hope Santa hears your bedroom furniture wish!! I love that scarf. Your IG pics inspired me to pick up a floral scarf at Tar'Jay today! Have a wonderful Thanksgiving girl! I'm with Makaila, first year sending out cards....now we'll just wait and see how long they sit on my counter before I actually fill them out and mail 'em! Also, your tree puts my tree to shame. For the life of me, I can't get your button over my site, but I've linked back anyway. Anywho - I'm leaning that way with Christmas cards this year too. I thought about going to one of those companies that sends them out for you, but, it's just so impersonal. So, I may just create a last minute card with our new baby and call it a day, via the web. May be tacky, but when we get back to the States, I'll make sure to make up for it with some real cards. I'm excited to be putting up our Christmas tree tomorrow!! Yay!! Love the outfit, that scarf is adorable and I can see why you have been wearing it so much. And since today is my new Random Wednesday Wishes day, I have a post about booties! Yours should be on my list because they are super cute! Are they comfy?? On the furniture front, would he let you strip it and restain it or paint it? That gives furniture a super updated look and if its real wood, you can do it without damaging it. Good luck! Happy Thanksgiving girly!! 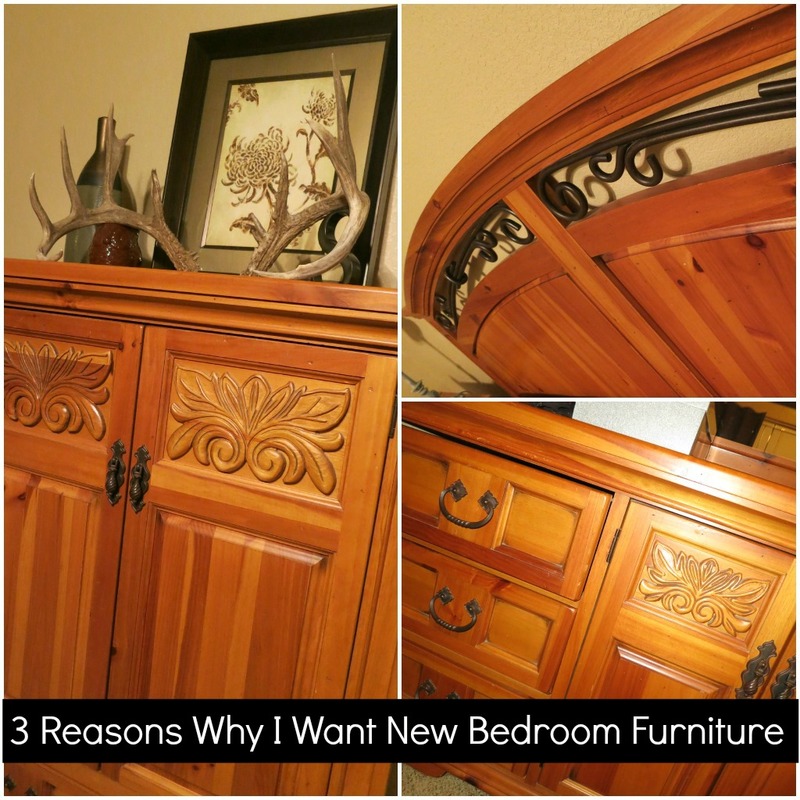 You should ask Santa for some new bedroom furniture! Your tree looks gorgeous. We're going to put ours up first thing next week...can't wait. Whyyy are you so cute?!? I love that scarf paired with that dress!!! Ok I freaking LOVE this outfit!!!! The stripes, floral, bold dress --- I want everything!!! That scarf is the perfect floral. 1. I love that scarf as well, super cute! 3. 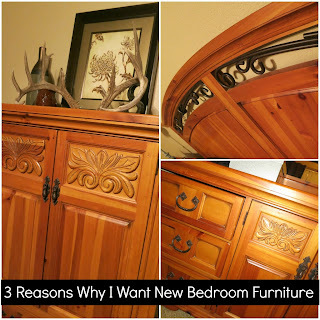 I think you definitely deserve new bedroom furniture and if you need help picking it out I am more than happy to help!! Or if you do the headboard you may inspire me to do one as well...I've been dreaming of one for a while now. That scarf is seriously fabulous! I have major scarf envy! Happy Thanksgivine Shanna!!!!! Love that scarf too! And your hair is super cute in that side bun! i absolutely LOVE that outfit =) everything about it. so so cute. I need to get a floral scarf. It looks great with everything. i can't wait to get our tree up! LOVE that scarf. We haven't done christmas cards in 4 years but when we did I think I used shutterfly and found a simple one I liked that was cheap. happy thanksgiving!!! I totally understand the furniture dilemma, I dealt with the same thing a few years ago with an outdated dining room set. My sister is an interior designer and she painted and glazed our old furniture. It is nothing short of amazing and saved us so much money. It had been that pickled oak color before and it is now a rich brown fabulous color! Just an idea! I hope you & your family have a wonderful Thanksgiving Shanna!! I love this scarf, your tree and completely agree about the Christmas cards. It is so nice but they are expensive! Loving your Random Wednesday link ups lady!! You are so gorgeous! I love that scarf - it really does go with tons of prints! I wish I had your sense of style, it's always so right on! And I love that you have your tree up already! I've been wanting to do ours but my husband won't let me :) I'm thinking about not sending Christmas Cards either this year. That floral scarf is really cute and does go so well with so many patterns! That Pottery Barn bed is gorgeous...I want everything in the entire catalog! You could PAINT the furniture. It would be a TON of work! BUTTTTT the results might be worth it! And way cheaper! 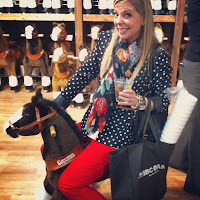 Although I fully support any Pottery Barn purchase! I'm on your side! Love that outfit! The scarf is so perfect for pulling the whole outfit together! I know what you mean about the holiday cards, everything is like a million dollars! Love your scarf too - I love it with the stripe cardi! 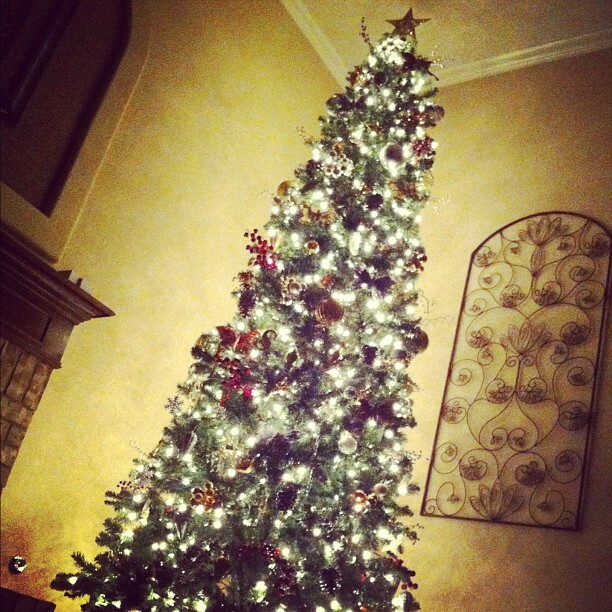 You are impressive to have your Christmas tree up! And I hear you about new bedroom furniture. We still have old stuff from ages ago and just can't seem to agree on set that we both like. Enjoy your Thanksgiving! One of my favorites of your outfits! 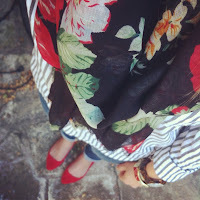 I love the florals and stripes and the red and black are fab. Have a lovely Thanksgiving! love how you styled that outfit! love random Wednesday Shanna!!! so fun and gorgeous as always! You seriously have the best outfits!! I love this one and your hair is super cute. I am going to link up today! yay! Cute outfit! I love the mix of patterns and colors. I LOOOOVE the cardigan on you! Vista Print has their holiday stuff 50% off right now meaning you can get cards fairly inexpensive. Just go to vistaprint.com/joy50 and the savings should be automatically applied to you. The cards we picked ended up being around 58 cents per card, but they had options that were even cheaper. But I do understand what you mean about just letting Facebook be your Christmas card. I was thinking about that this year as I ordered our cards. 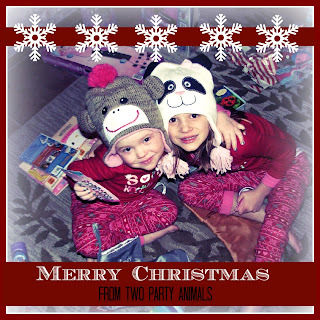 Especially since the photo we are using for the cards is on Facebook already. But yeah, at least for this year we are still doing old fashioned, put 'em in the mail kinda cards. I LOVE that scarf too - but come on, you knew I would ;) Love both the outfits you wore it with also. Again, no surprise there. As for the bedroom furniture, new hardware? I'm all about painting too, but it's solid wood and maybe Ross would be against that. But I painted some bedroom furniture and gave it new hardware once, and it did the trick! Happy Thanksgiving, toots (as in tootsie, not farts, haha!)! That scarf is gorgeous!! Loving that it goes with everything. I think it's totally OK to skip cards! I love this look. And that scarf is incredible. And your hair is so pretty like that. I am so in love with your gorgeous tree! I wish mine looked like that! that cardi and scarf are amazing on you! I tried to link up today, but kept getting an error...Have a Happy Thanksgiving! I absolutely love that cardigan. I am such a sucker for a cozy cardigan or sweater! I still love your tree and even more that you plan ahead! And you still need to do a scarf tutorial for me because I'm a complete moron. I love LOVE love that scarf! You are rockin it for sure! I think you should send out Christmas cards because I really want one!!! I need more red in my closet after seeing this outfit. you look gorgeous! I love your hair like this. I must know how you do it! Stat! love this, shanna!! you look beautiful <3 i am teetering on not doing christmas cards, too.... if i find a good deal i'll let you know! Wow - I can't believe you have been married for 12 years!! You must have been straight out of high-school... you don't look old enough to have been married 12 years. I say that calls for new bedroom furniture! Target postcards or cards if you buy more than 20 they are less than $1! Love the scarf want it! Girl, your outfit is too cute. I hope you do get new furniture for your bedroom, you deserve it. I love that scarf...I wouldn't have thought to pair it with that cardigan, but it WORKS! I love the b&W striped combo with the solid red! Totally inspired to recreate this! Totally love the way you've styled it. The red is fantastic. Love the black & white cardigan that tones down the red and the scarf is too too good. I have that cardigan :) Now I need to get that scarf! I love it!